Heavy-duty home filtration system delivers purified water to every faucet in your home or office. 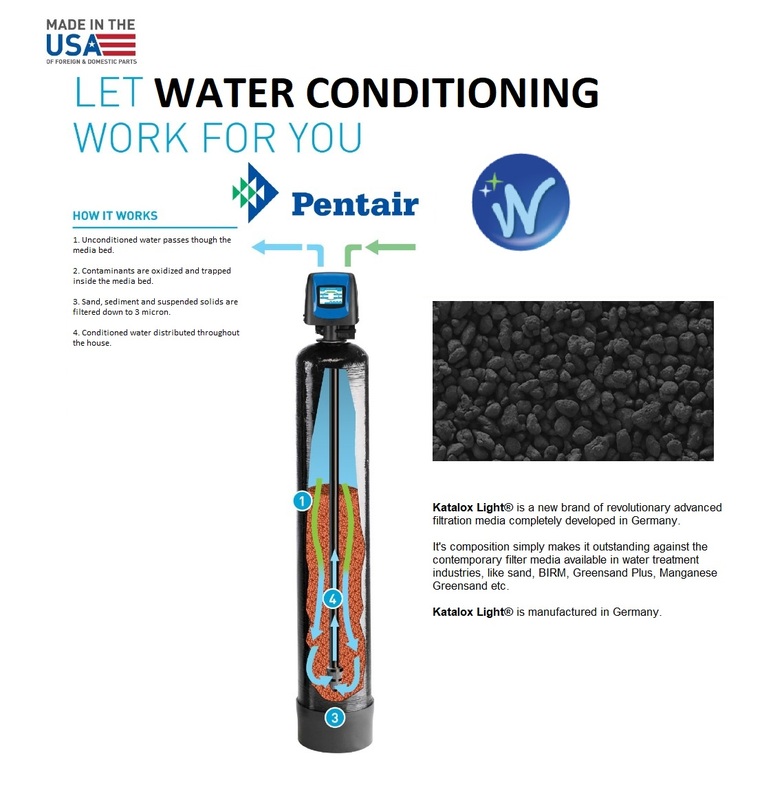 Capable of filtering Suspended Solids, Sediments, Turbidity, Organics, Color & Odor. Capable of removing Iron, Manganese, Hydrogen Sulfide, Arsenic, Radium, Heavy Metals, & Radionuclides. Reliable optical electronics eliminates microswitch positioning problems. Touch-screen control value provides quick setup and programming. Quick Connect clips allow easy installation and maintenance. Super capacitor back-up saves settings during power outage. Field programmer for quick configuration and diagnostics data downloaded for PC via USB. Two programmable auxiliary relays for commercial/industrial reverse osmosis pre-treatment lockout applications. Attractive and durable stainless steel finish. The WECO Backwashing filter with Katalox Light® is a specialized Point-Of-Entry (POE) system for municipal and well water supplies. Made in Germany, Katalox Light consists of manganese dioxide (MnO2) coated onto naturally mined ZEOSORB. This is a light-weight filtration media with many valuable functions and properties related to water treatment and remediation. Katalox Light media has a very high surface area which filters out particulate matter down to three microns. This is an ideal media to use for removing Totals Suspended Solids (TSS), turbidity and sediments like sand and oxidized mineral particles. Katalox Light also has oxidation properties. Iron, manganese and hydrogen sulfide are easily removed with this media. The active surface coating oxidizes and precipitates soluble iron, manganese and hydrogen sulfide, which are flused away in the back wash operation. The media also removes lead, copper, radium, uranium as well as other heavy metals and radionuclides. Katalox Light generally needs to be backwashed every 2 to 5 days. Hydraulic fracturing releases naturally occurring heavy metals and radioactive materials from shale deposits, and these substances return to the surface and are collected as wastewater. Radioactive traces are also used to monitor the fracking operation. Wastewater from the wells is released into rivers, injected into wells, and evaporated from ponds. Radon and Iodine-131 are health concerns in fracking areas. Water enters the top of the tank through the Fleck control valve and passes downward through the Katalox Light filter media, which removes impurities. 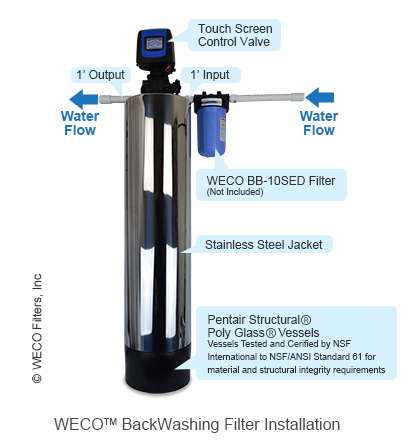 The WECO backwashing filter will clean itself periodically by rinsing away impurities it has filtered from water. When the filter medium is saturated with contaminants, the control valve automatically starts the backwash and regeneration process. The backwash procedure is an operation where water passes backward through the filter media at a fast flow rate. It enters the tank at the bottom through the riser tube, then flows upward through the filter medium, exiting at the control valve and sent to waste. The rapid, turbulent upward waterflow, in addition to flushing away particulate matter, loosens and resettles the media bed, preparing it for another filtration cycle. The treated and conditioned water enters the riser tube at the bottom of the mineral tank, passing upward and exiting the filter through the control valve. The WECO backwashing filter with Katalox Light is available in a variety of sizes. The filter can be operated stand-alone or in conjunction with other filtration processes. Please contact WECO Technical Support for expert assistance sizing and configuring your filtration system.